Ages ago I did a post about the pros and cons of having carrara marble here. It was one of my most popular posts, with examples from some great bloggers and decorators, but it’s been three years and I have learned and seen more so I thought I would do an update! I am afraid this may get long because there is so much material to cover so I am going to say there will be two parts. And let me also say, I am not an expert, these are simply going to be my observations and experiences with clients and others… what we have used and found to be true. This could easily be a huge indexed research paper! Remember this is just a blog post! background” but even then, the carrara is getting darker I believe. Honing it makes it a bit lighter, softer BTW. I thought this was interesting, honed on one side and polished on the other! Recently while in New Orleans visiting two different stone yards with a client I was shocked at how gray the “basic” carrara looked. I have never really dealt with this issue too seriously because I just love the material and haven’t been concerned style wise when clients have mentioned this before…yes it was gray but it was on WHITE cabinets and still pretty. But I started to take notice in New Orleans because we are doing GRAY kitchen cabinets in brick floors and I didn’t want it to be washed out or too dark. Notice this photo below. 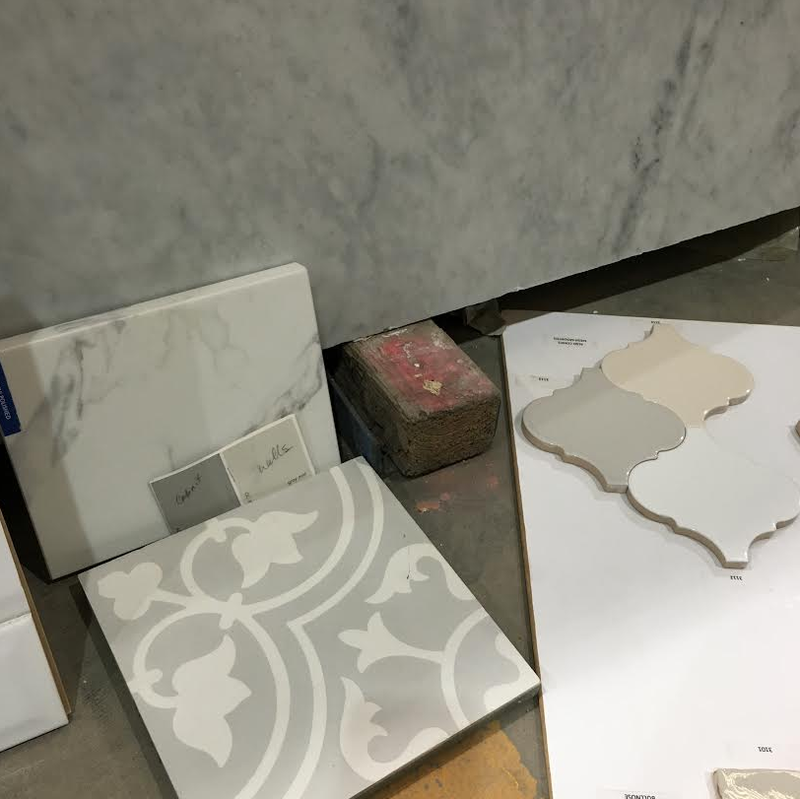 Notice on the paint swatch the cabinet color on left…it looks great on the small “marble” marble sample its leaned against but against the larger slab behind that, blah..the big slab looks so dark against that lighter small sample agreed?? What is that small sample?? Let’s just go with that right?? And we thought it looked great based on the small sampled. And decided “well we will just go with this, its stain resistant and will be great”..then in the middle of the night I woke up in my client’s six year old son’s bed in a panic thinking “what does an entire slab of this man made stuff look like?” It was the holy spirit because LOOK Y’all THIS is what a big piece of this “Borghini” looks like..sure its stain resistant and bright white background but it looks like too swiggly hoses running through it…it is not a tight soft movement like the small sample indicated to us..our fault totally. So glad I looked up a photo for the entire slab. Yikes not what we wanted..maybe fine for another project but we were wanting a tighter, softer “all over veining” like you would find in “basic” carrara! Now the week before I was checking on a job in Houston where we used TWO different type of quartz (man made) counters and I LOVED IT! So I am not saying man made materials aren’t good…not at all. I mean just look..these are good! This is my phone pic of the slab on the bed of the truck in my client’s driveway..this is not lifted from pinterest in another state or country…this happened two weeks ago. Ladies and gents I give you LG’s Minuets and Rococo and its good! One is busier than the other…this is the Rococo more “busy” for sure… we used it in master bath and it looks so lovely! And the Minuet which is softer in kitchen! You can see mucho about this LG product on Pinterest here including photos like this showing my client and I’s two fave patterns (the ones above) side by side! But back in south Louisiana, not the burbs, the client just felt she needed the natural stone of true carrara (and I agree) after all its a frame house with brick floors and old beams so we set out the next day to see actual slabs of some of these manmade quartz counters and hopefully find another bundle of marble to look at with our gray paint chip! I honestly didn’t think we would find a place with full slabs of the quartz but we found one and they laid the different slabs side by side for us! And its fascinating! 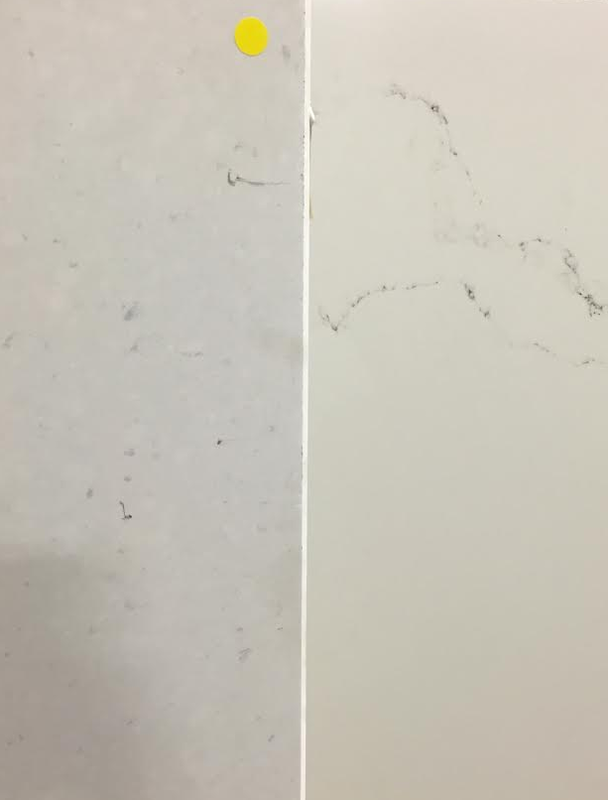 First we put two manmade quartz slabs side by side…Caesarstone’s Frosty Carrina (left) and Statuario Nuvo (right)! And I liked them both! Below is the Satuario Nuvo by Caesarstone! 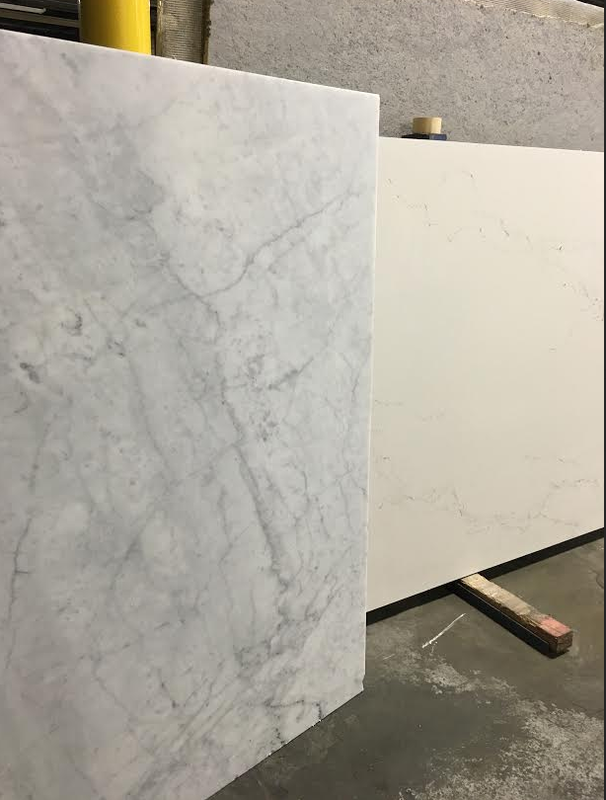 But when my client saw the carrara placed beside it she new she had to have it even though it is more gray…I do think its less gray than the first slab we found. 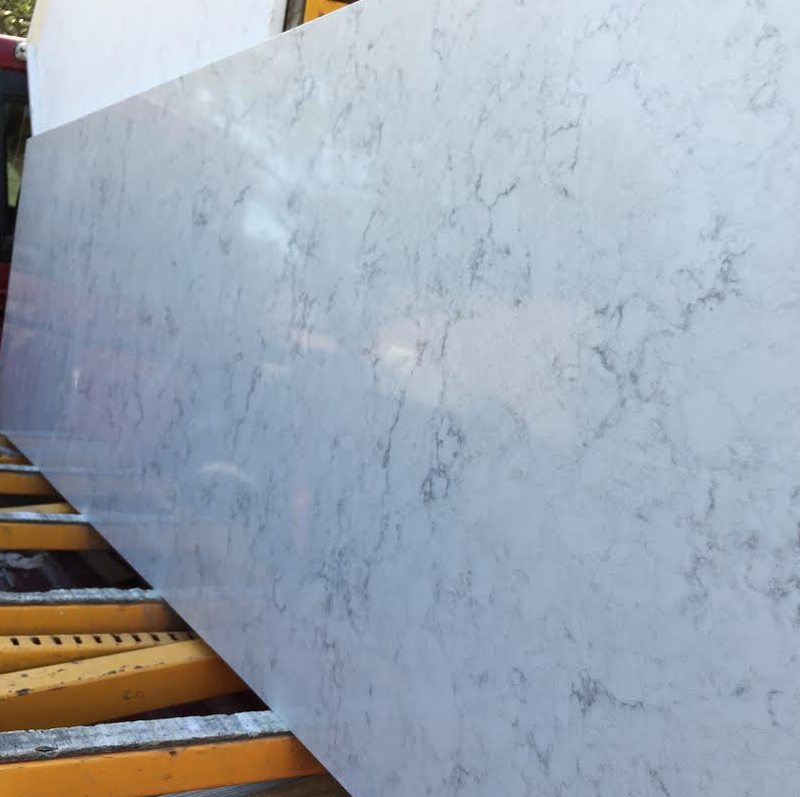 So there you go, Cararra is getting more gray from the earth I think BUT people still choosing it…we did find some Statuary we loved but that slab yard wasn’t open…so we found another slightly lighter bundle I think of the carrara. 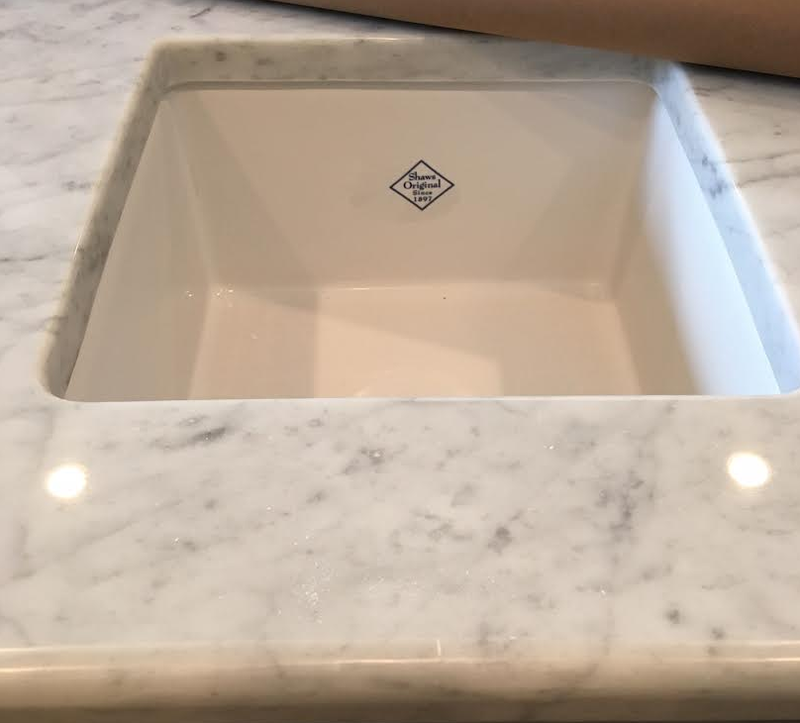 Another client below (Old home renovation in Sealy) chose “basic” carrara as well….and its POLISHED ..yikes etching and stains, I actually think it will be okay with the amazing sealers they use now AND the polish with the grandeur of the home! (And don’t you love this baby Shaw sink it the island) More on this project coming soon! I think the bottom line is FEEL, STAINS and also price. AND GO LOOK AT SLABS with your paint colors/chips! This going to look part is imperative even if you have a designer! Do you want the natural feel of stone? Or are you type A and will water etching or even the thought of it bother you? Is your home old or are you trying to build a “new old house?” Or are you in the suburbs? Do you u like to use bleach and or ammonia or vinegar to clean? 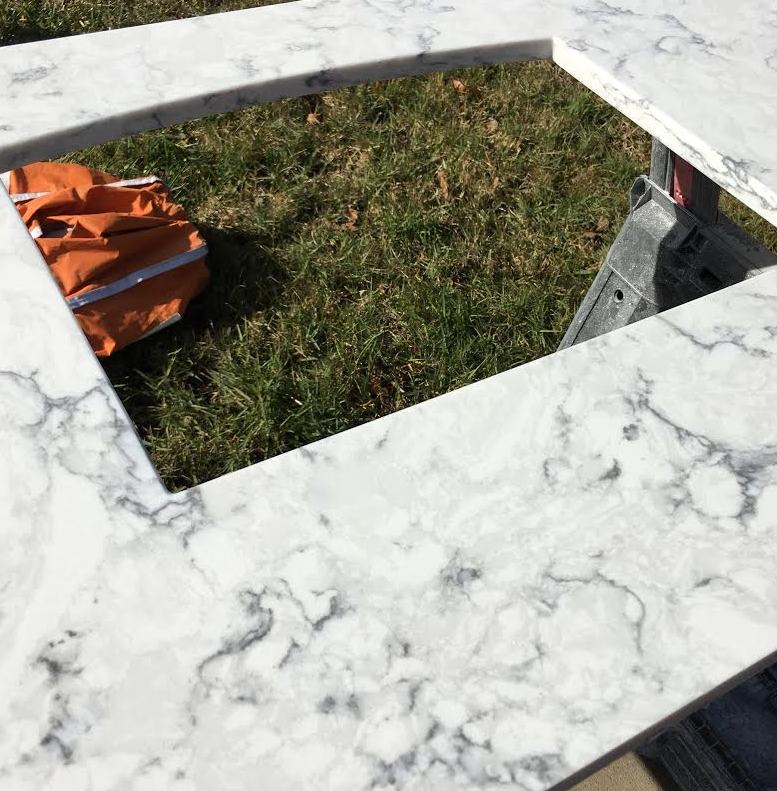 Next installment of “Let’s really talk about marble” I will show you photos of the DOLAMITE option..sometimes called Super white granite but its NOT granite and also LAMINATE that looks like marble! we used Caesarstone’s London Grey in our kitchen reno and love love love it because it looks like marble but with the stain resistance. 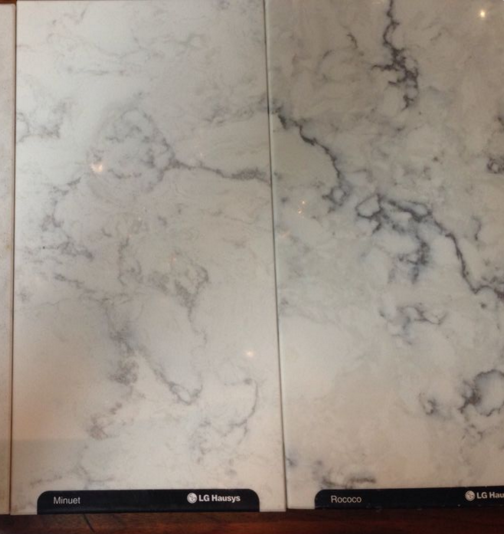 with three boys and OCD for keeping my house clean i personally would never choose marble for my own kitchen, just me though. i love the look don’t get me wrong…maybe in a bathroom or when my kids fly the nest 😉 until then i’m stuck on caesarstone. we’re even using it in our laundry room reno right now. 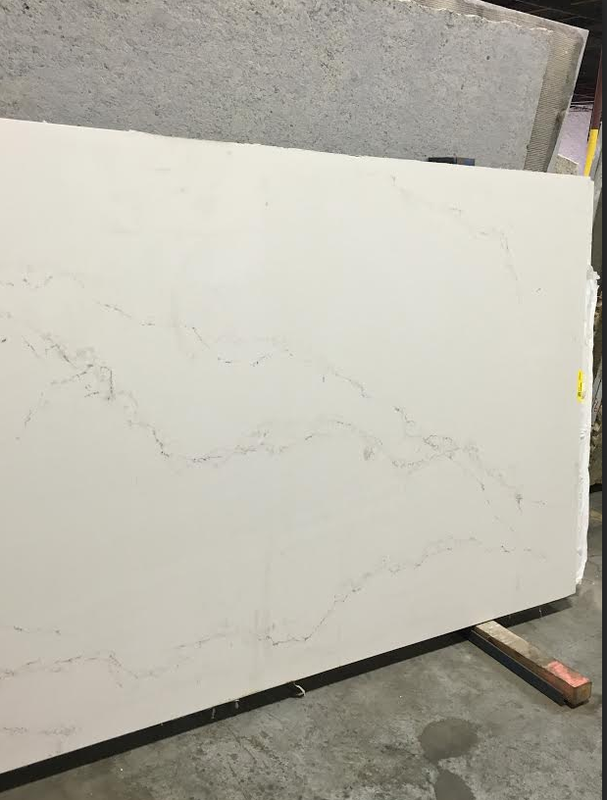 We have Cambria Torquay quartz and I love it! The coloring and veining is super soft and very white. As much as I like some of the other quartz options, many come off too ‘vericose veiny’ to me and I just can’t get past it! Ha! I would have loved to have done real marble in our old house, but when it got down to it, I knew my type A personality could not handle it, and I am so glad I chose the option that allows me not to worry. Plus they are a cinch to care for and clean. The only lessons I learned in the process of getting quartz was to definitely see the full slab! In my case, there were no full slabs available in Tulsa, but one place had a 1/2 slab, and that helped. 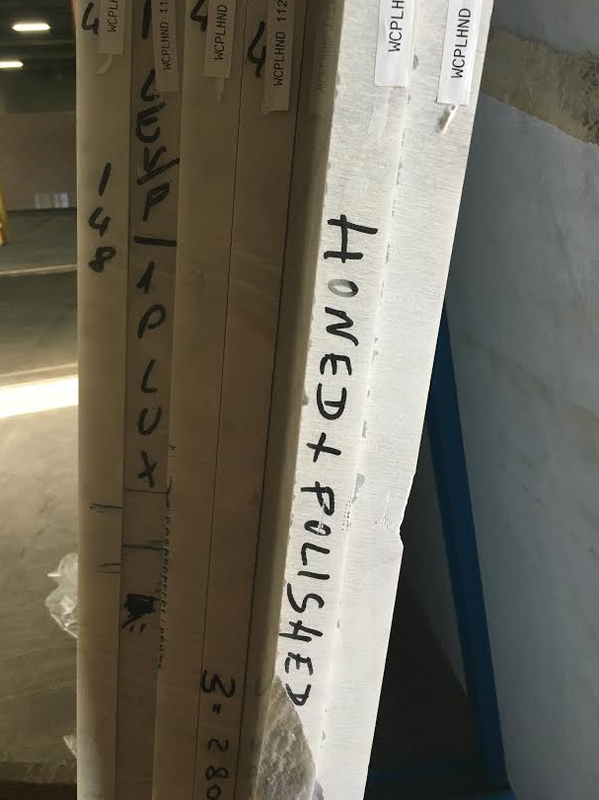 When the slab we ordered arrived at the shop, I still went to see it and I was so glad I did. 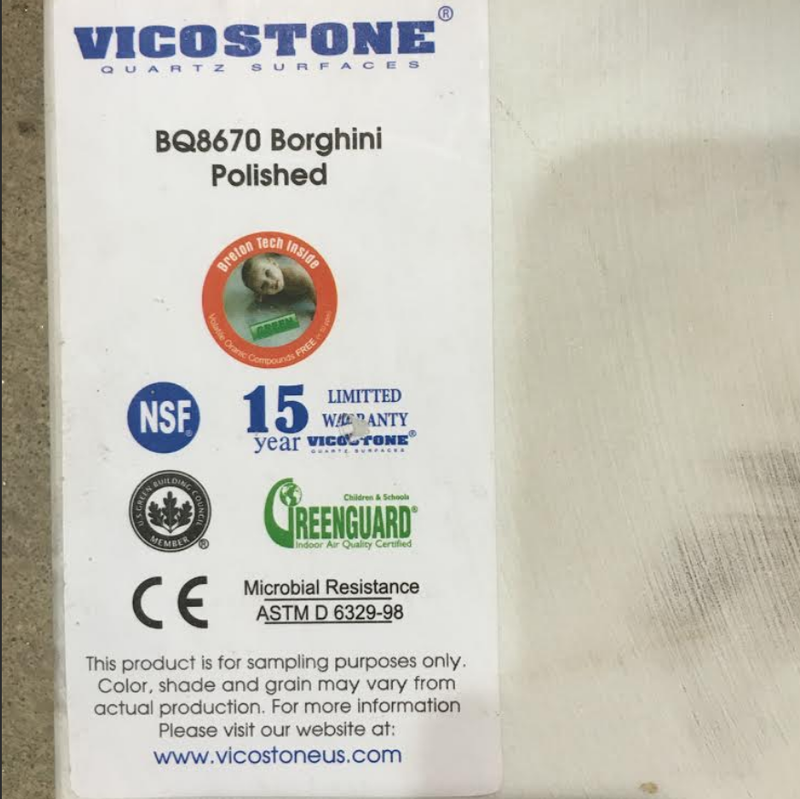 I guess in the process of making the quartz, the dye or whatever is used to create the color and veining can cause slight imperfections at times, and mine had about 3 black pen/sharpie looking dots, that I am so glad I saw, pointed out, and our fabricator was able to cut around. If I hadn’t gone to see it when it arrived, and back again when it was being templated, I would have been so upset with those marks showing up in my counters. Also, one place told me the only drawback they have come across for this quartz is not to put anything too hot on it for an extended period of time. He specifically said they had someone who left a crockpot on it for a long time and it cracked. That was the only instance he had ever heard of that happening, but I still take precautions and always put my crockpot on a heavy wood cutting board, just to be safe. We have had them for going on 4 years now and I still love them! 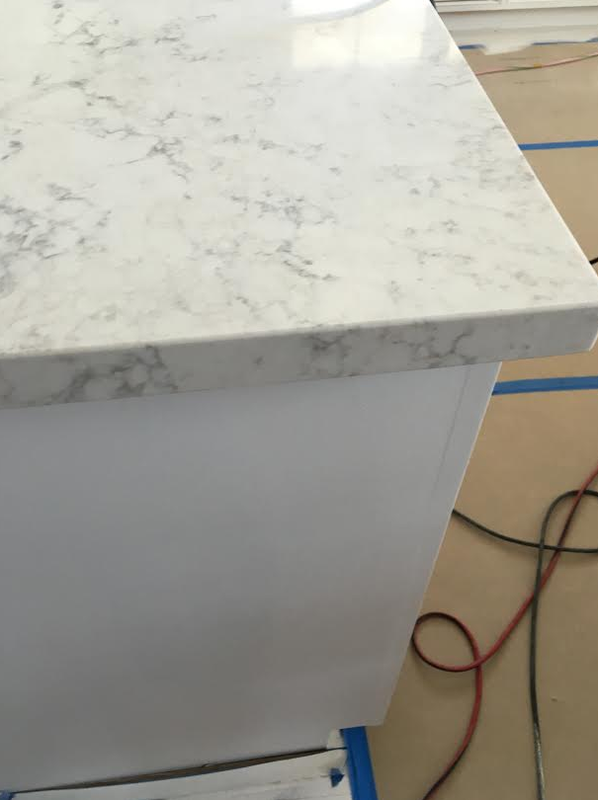 We were on a tight budget and did 12×24″ carrara marble tiles (counter depth) for our perimeter countertops. I thought they would be gray too, but then the tile person said they are getting through the gray chunk of the marble mountain (at the quarry) and are finding more white there. 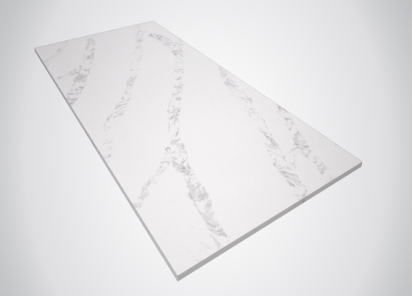 I don’t know if that’s true or not, but our tiles are definitely white marble. I remember your last post about marble and how it etches. We had been etch-free until last week, when I finally got to see what you mean about etching! I can’t figure out what did it. It’s polished marble, by the way. What types of things cause the etching and is there anything you can do once it happens? We sealed the tile when we put it in (3 months ago). Will sealing again get rid of it? Thanks! Hoping for some suggestions! my thoughts – carerra is grey now – but calacutta ora is beautiful. look for that. more expensive though. you could do the cheap carerra with a white cabinet to offset the gray – and that looks great. my issue is with the marble itself. mine look AWFUL in the light. AWFUL. the etching is terrible. blotches everywhere. Sally Wheat had her white marble restored – cheap, she said. resealed. i need to do that – i’ll let you know how it goes. as much as i love marble, i might do the caesarstone now. Joni this is great feedback and review..if joni might consider caesarstone now that is saying a lot y’all! Interesting they think they are “getting through the gray” in the marble mine..i think it comes from one place..isnt that amazing?? Except Danby which is from CT right? I like the gray cararra – most people seem to do white cabinets, which look really pretty with gray counters. I was just in the Cambria showroom last week and they have some really pretty stuff that looks like marble, but just not quite enough. For me personally, quartz is always going to look like quartz and not stone. 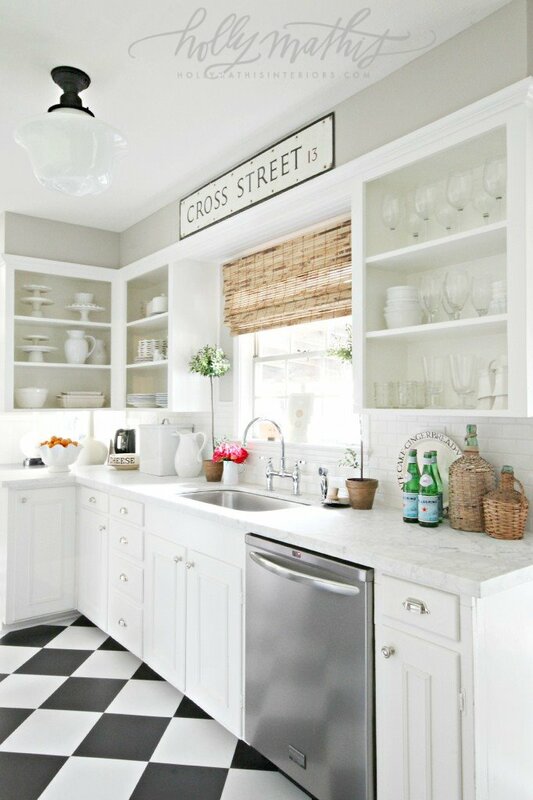 I really like a clean white or black quartz, and Caesarstone has some great new colors that look like concrete. I would love cararra in my kitchen even with three boys who love to make lemonade! My neighbor has the Danby marble in her kitchen – it is whiter than cararra and supposedly harder, but it still marble, so not nearly as hard as quartz. Marble is just so pretty that it’s worth the trouble! I have to say I’m still in love with my marble countertops. I have a bunch of watermarks. But they are honed so I just think it kind of adds to the patina. I think I just lucked out. I gave the contractor a tiny slab of the marble I liked so I did not do a lot of homework or research at all. But I haven’t regretted them for a minute! I do need to stop using them as a cutting board though because the scratches are getting a little out of control. I’m learning I’m becoming less type A as I get older! Wonderful informative post Holly! I have polished carrara and not one stain. We used a great sealer and not even wine left overnight will stain it. I don’t baby these counters at all. I do have some etching. I’ve noticed it’s been from anything too hot or cold-my husband’s Yeti cup. Thankfully, these can be buffed out. It will be a year we’ve had the counters this summer and that’s when I will all the guys out to buff the counters. But, the etching honestly isn’t noticeable unless the sun is hitting the counters just right in the late afternoon. Just use a great sealer and have a company come out once a year to buff scratches and etching, and you’ll be good! We are building a “new old house” and I chose the Carrara for our bathrooms. I realized that the whiter the more expensive the marble would be. I had no idea about all the differences before we started this process. I definitely saw some really gray slabs when we were looking (we were in Dallas on zodiac lane). Great article explaining it! It took searching through a few bundles to find a slab we liked that was the right size for the project.